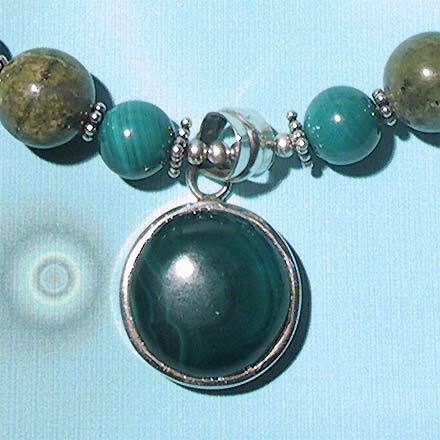 Sterling Silver Malachite and Unakite Necklace. See Closeup. I think I made this necklace on Saint Patrick's Day...not surprising, as *Green is the Color* here! (a little Pink Floyd reference). The incredible bright, Kelly Green (or light Pthalo green for you painters) of Malachite and the more Neutral, Olive Green of Unakite play off of eachother for a very unusual yummy color sensation. And speaking of pink, there's only a hint of pinkish orange in the Unakite, as I picked out the greenest Unakite beads for this one. 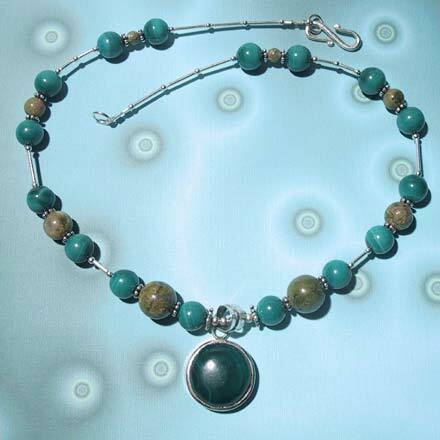 This beaded necklace has a cute little Malachite button pendant, approx. 1¼" including setting. The length of the necklace is 15½". For those who are interested in Astrological significances of stones, Unakite corresponds with Scorpio.